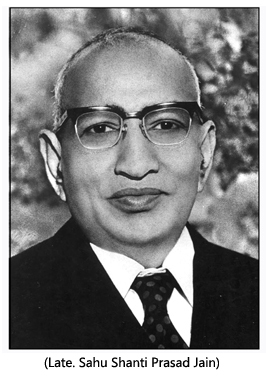 Sahu Shanti Prasad Jain was a well known industrialist and philanthropist of India. He was also the former chairman of Bennett, Coleman & Co (BCCL). He was born in the Sahu Jain Family at Najibabad in Uttar Pradesh on 22nd May 1911. His grandfather was Sahu Salekh Chand Jain, who was involved in religious and charitable activities. His parents were Sahu Diwan Singh and Smt Moorti Devi. After the early passing away of his father, he was primarily raised by his elder brother Shreyans Prasad Jain. Sahu Shanti Prasad received his primary education in Najibabad and went to college first in Meerut and later at Banaras Hindu University. He completed his B.Sc. from Agra University. In 1932 he got married to industrialist Ramkrishna Dalmia’s eldest daughter Rama Dalmia and soon joined his father-in-law’s large empire. He was gifted in matters of finance, economics and commerce. Under his stewardship, Dalmianagar in Bihar developed into a massive industrial town rivaling those of Tatas and Birlas, with factories producing sugar, cement, paper, chemicals, vanaspati etc. employing top professionals of the country. He had four children, Sahu Ashok Kumar Jain, Sahu Alok P. Jain, Sahu Manoj Kumar Jain and Alka Jain. Though Shanti Prasad Jain was born in to a family of wealthy landlords, it can be safely said that he built up his own business empire through sheer grit, hard work and determination. In 1955 when he took charge of the BCCL, he turned it into one of the largest media groups of the country. He went on to acquire and run many more companies and industries like banking, sugar, plywood etc till the time of his passing away in 1977. He was a devout Jain and was awarded the title of “Shravak Shiromani” by the Jain community. He also donated freely to many Jain causes and institutions. Rama Jain was born in Calcutta in 1915 to the well known industrialist Seth Ramkrishna Dalmia and his second wife Durga Devi. Her primary education happened at home but she further expanded her knowledge through institutions at Wardha where the influence of Mahatma Gandhi prevailed. She was a ward of Shri Jamnalal Bajaj at Wardha and her companions were his family. Educated and brought up in a lofty environment, her mind grew with a richness and enlightenment not attaching importance to the value of wealth as such but to the satisfying and noble objective of utilising that wealth for the betterment and intrinsic development of humanity. 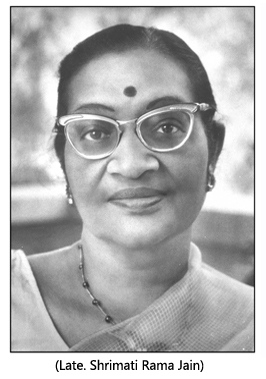 She was married to Sahu Shanti Prasad Jain in 1932. A typically urban girl, she also had a love for the rural and her outlook was moulded in an atmosphere which had the impact of Gandhi’s strong and powerful ideas of simple living and lofty thinking. A profoundly devoted wife, a talented and an affectionate mother, a self- disciplined individual, scholar and thinker, a person of refined taste believing in simple living and high thinking, Rama Jain was a dynamic organizer in social and literary fields. She was also a patriot with a warm attachment to the great traditions of Indian art, literature and culture that resulted in her laying the foundation of Bharatiya Jnanpith in 1944. A woman with a practical approach, broad vision and liberal outlook; the harmonious blending of the traditional and the modern in living epitomized Rama Jain.